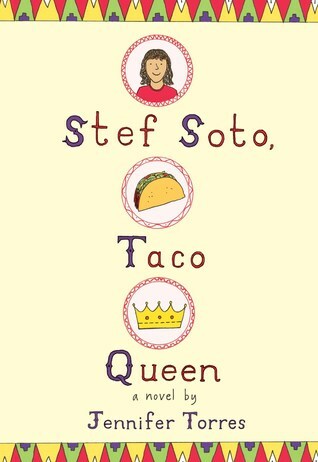 Stef Soto, Taco Queen by Jennifer Torres. Grades 4-7. Little, Brown Books for Young Readers, January 2017. 166 pages. Reviewed from ARC provided by publisher. Tia Perla huffs and wheezes and always looks a little bit grubby, no matter how clean she actually is. Tia Perla leaves anyone who comes near her smelling like jalapenos and cooking-oil. Papa had pretty much promised to stop bringing Tia Perla to pick up Stef at Saint Scholastica School. But there always she is. Tia Perla. The family's TACO TRUCK. All Stef wants is to be a normal seventh grade girl. She doesn't want to be the weirdo riding home in the taco truck after school every day, especially when she overhears her former friend calling her the Taco Queen. All she wants is for her father to have a normal job so she can stop being the Taco Queen once and for all. But when the city wants to make new rules about food trucks, strict rules that could put her father out of business and end his chef dreams forever, Stef will have to figure out a way to make peace with Tia Perla and just maybe save the day. This is such a cute story, perfect for fans of contemporary fiction and foodies. Stef's story read like a Disney Channel movie, and I mean that in a good way! It's a sweet tween read about dealing with friends and pressure at school and, yes, some unexpected adventures that take some creative thinking. I love food trucks and I really liked the descriptions of Mr. Soto's culinary creations, too. Put this on your watch list now! Readers looking for more stories of Latinx families may enjoy Ask My Mood Ring How I Feel or Confetti Girl by Diana Lopez. Foodies should definitely pick up Tara Dairman's All Four Stars series for adventures with another "culinary queen".